In the deadliest crash this month, a passenger bus crashed into a parked semi-trailer truck, killing 13 people and injuring 21 others in Turkey's northern Çorum province on Tuesday. The accident occurred around 6 a.m. Tuesday near the Kumbel village located in Çorum's Osmancık district. The bus with 35 passengers departed from Istanbul and was reportedly its way to Tokat province. Speaking to reporters after investigating the scene, chief prosecutor Ömer Faruk Yurdagül said the bus originally departed from Tekirdağ, a city west of Istanbul, before collecting the majority of its passengers from an Istanbul bus depot. 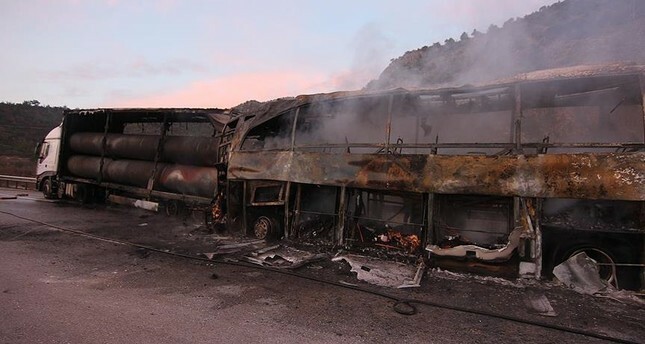 "There were 35 people onboard, including three staff members of the bus company," Yurdagül said, citing that one of the injured victims was in critical condition. He confirmed that the victims included children. The chief prosecutor said the truck carrying natural gas pipes with a Georgian license plate had parked after it broke down, and the exact cause of the crash was still being investigated. "Most passengers were asleep, so they are not aware of how it happened," he said. The wounded were taken by ambulance to nearby Osmancık State Hospital and Hitit University Çorum Training and Research Hospital. Officials expressed concern that the death toll could grow, due to severe injuries among surviving passengers. The sources said that it was difficult to clarify the number of people who lost their lives because the bus was completely burnt. Recalling the moments of the accident, passenger Emine Güngör who survived with her baby, said: "Everyone was asleep in the vehicle. I was the only one awake since I was taking care of my child." "Then with an explosion sound, all windows broke and the bus started to shake. The backside of the bus started burning amid people's screams. After that, a man broke the window and we managed to get outside. The ones who stepped out of the bus survived, while the others lost their lives," Güngör said.